The phrase "words can't describe it" is often used when a person is trying to articulate something either extremely good or extremely bad. And mere words definitely could not describe the extremely bad winter of 1886-87 for the Montanans who experienced it. Starting with a late fall arctic fist that slammed into the Territory's cattle country and never let go, cowboys, ranchers, and homesteaders deserately hung on for life as snow piled higher, temperatures fell lower, and food ran out. In addition to protecting his own Judith Basin herd that winter, OH Ranch owner Jesse Phelps looked after five thousand head of cattle branded "Bar R" by Helena businessmen Louis Stadler and Louis Kaufman. Deep into the frozen February of 1887, Phelps received an urgent letter from a worried Kaufman concerned about how his livestock were faring. Weeks of fighting snowdrifts and 30-below-zero temperatures trying to keep the herd alive made it impossible for ranch hands to figure out how many cattle had perished, and Phelps just didn't know how to express their misery. A young cowboy named Charles Marion Russell, working at the OH Ranch that fateful winter, had a moment of inspiration as he watched Phelps struggle to give an accurate assessment to Kaufman. The 22-year-old from St. Louis had always been artistically inclined, and while the promise of adventure on the range called him out to Montana in 1880, he continued to draw and paint scenes from his life on the ranch. His watercolors were with him at the OH bunkhouse, and using a small piece of scrap cardboard Charlie quickly rendered what would become the first of his many iconic western masterpieces. From inside the bunkhouse, Charlie's sharp memory and eye for detail perfectly captured the plight of an emaciated steer only barely surviving against a bleak white background. His loose yet accurate brushstrokes show the cow's skeleton stretching and protruding from the forlorn cowhide with painful anatomical precision. Charlie also illustrates how the steer's tail has been gnawed down by the taunting wolves while they wait for the inevitable death. This subtle observation about the how helpless the steer is to the relentless weather and predators gave chills to the cattlemen who saw the picture. With his trademark black humor, Charlie called the postcard-sized painting Waiting for a Chinook, and added the iconic cow skull to his signature for the first time. According to an interview he gave near the end his life, Charlie told Phelps to put the painting in with his reply to Kaufman, but the veteran rancher said, "Hell, he don't need a letter; this will be enough." And it most definitely was enough. While Phelps' words couldn't describe the cold hell the cows and cowboys were going through, Charlie's simple, powerful image created a sensation back in Helena. Distraught by the mournful scene, Stadler and Kaufman showed the painting to other cattlemen and investors around town, and anyone who saw it lost hope that any of their livestock would survive until spring. Soon, it seemed that everyone in Helena had seen the painting—or if they hadn't they certainly heard about it. The warm chinook winds eventually swept in, and when winter finally released its death grip, it was estimated that as many as 60% of all free range cattle in Montana had perished in what was called "The Big Die-Up." This disaster, with the resulting business losses as well as new laws created to protect cattle from overpopulation and overgrazing, signalled the end of the classic cowboy era in the west. But it was the beginning of Charlie Russell's career as an artist. In May, 1887, The Helena Weekly Herald said of Charlie: "the fame of an amateur devotee of the brush and pencil has arisen in Montana, and nurtured by true genius within the confines of a cattle ranch, has burst its bounds and spread abroad over the Territory." Waiting for a Chinook made Charlie famous in Montana, and while he loved life as a cowboy on the open range, as an artist he was heading toward much broader horizons. While winter provided the grim inspiration for Charlie's first success, the season was prominent in his next stage as an artist. He was doggedly self-taught, and while his early career is marked by perhaps having more talent than ambition, eventually he started to get illustration work in magazines. Charlie submitted Caught in the Act to Harper's Magazine and to his surprise it was published in the May 12, 1888, issue. The painting revisted the terrible winter of 1886-87, showing how dismal and unforgiving the weather was for the people trying to survive. A family of Crow Indians, starving and desperate, have killed a cow owned by a local ranch and are in the process of butchering it as two cowboys come upon them. The painting, made only a year after Waiting for a Chinook, represents a huge advancement for Charlie both in painterly skill and storytelling. A natural storyteller, Charlie may not have been the best cowboy or sheepherder around, but he was the man people wanted to have around to tell nostalgic tales of the quickly changing west. Many of his experiences became the subjects of his paintings, even featuring likenesses of the men that were present at the depicted event. Caught in the Act embodies the deep respect Charlie had for the native people, and this theme was constant through his career. 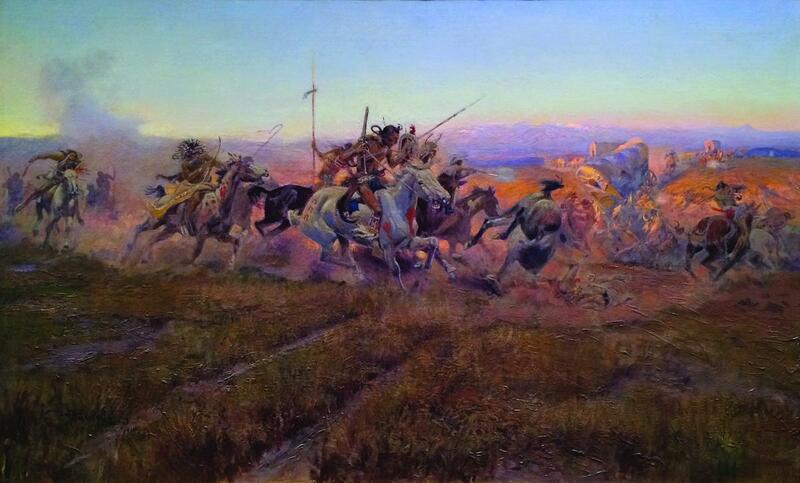 Other artists of the time presented Indians as stereotypical villains, mysterious, or more often than not, little dabs of color way off in the background as heroic white men filled the foreground composition. Charlie took these standards and flipped them, making sure his art includeda Native American point of view. As all Montanans know, winter is never far away—from our minds, hearts, or calendars. Charlie painted many winter scenes throughout his career with increasing skill and compositional wizardry. Some paintings were adventurous usually with a person or animal precarious on an icy cliff, many were pure sweet golden nostalgia involving friendly cowboys and a warm Christmas glow, and quite a few were of the proud kings of the winter—elk or buffalo majestic against inspiring mountains or plains. While many of these works are considered masterpieces, Charlie best showed the reality of a true Montana winter with the two paintings at the beginning of his career. Waiting for a Chinook and Caught in the Act truly capture a feeling and an experience that words can't describe. If you want to catch some C.M. Russell winter—or any season!—paintings in person, make sure to visit the C.M. Russell Museum in Great Falls. Established in 1953 and located on the same land where Charlie's home and art studio still stands, the Museum is a world-class collection of Russell paintings, illustrated letters, sculptures, personal artifacts, and a huge amount of other western history and art. For Distinctly Montana's Winter issue, the C.M. Russell Museum sent over some snowy pieces from their collection for you to enjoy. Shaping up to be the greatest assembly of C.M. Russell masterpieces in over a decade, this exhibition explores the visual connections to American and Canadian western heritage and the role of cultural performance in shaping public memory. It examines the period of World War I’s immediate aftermath in the artwork of Montana artist Charles M. Russell at the 1919 Victory Stampede in Calgary, Alberta. 100 years ago, a highlight of the Stampede was a fine arts show that featured paintings and bronzes created over the course of the war by C.M. Russell. The upcoming exhibit in 2019 captures the same spirit and social commentary about the changing West that made the original Stampede a milestone in Russell's celebrated career. Please go to www.cmrussell.org for more information about the exhibit. VIDEO DESCRIPTION: Jodie Utter—Conservator of Works on Paper for the Amon Carter Museum of American Art in Fort Worth, Texas—shares her findings from an in-depth study of Russell's watercolors, using a variety of scientific instruments that revealed the pigments and papers he used. She discusses how he obtained these materials on the frontier and how his preferences and techniques changed over the course of his career. Presented at Montana's Charlie Russell: 21st Century Perspectives on the Cowboy Artist, hosted by the Montana Historical Society in June 2015.